Years ago my friend Kathy got me addicted to the amazing H bags from Brooklyn Industries. These canvas giants seriously hold everything you could possibly shove in them without ever feeling impossibly heavy, and I’m about to wear out my second large one. 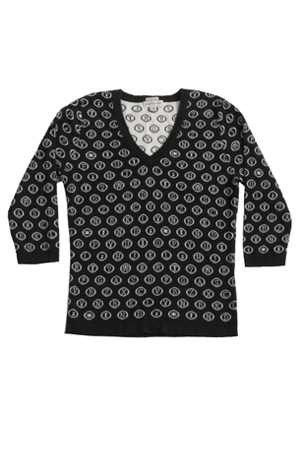 So while looking for a new one to treat myself to this fall, I saw this Typewriter sweater. I want it. I have to have it. It is the ultimate in librarian fashion. Unfortunately, I am violently allergic to wool. So before I drop that kind of money on it, I’m digging through my closet to make sure I have enough long sleeve tees and button downs to buffer this sweater from my skin so I get maximum usage this fall. And I am still deciding which H bag pattern I want next, too.